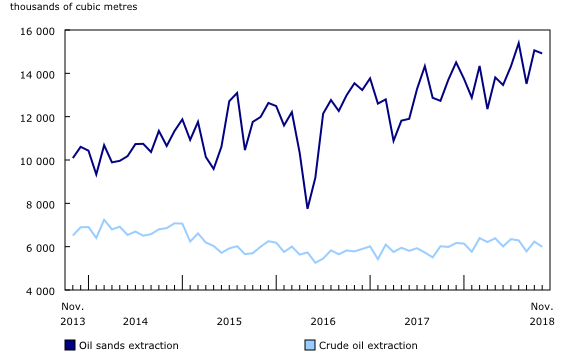 Canada produced 22.8 million cubic metres (143.3 million barrels) of crude oil and equivalent products in November, up 6.6% from the same month a year earlier. In the 10 months prior to November 2018, total crude and equivalent production averaged 21.8 million cubic metres per month. Synthetic crude production, up 14.9% to reach its second highest level on record, was the main contributor to the overall year-over-year growth. Increases in non-upgraded crude bitumen (+5.3%), equivalent products (+10.7%) and light and medium crude oil (+0.6%) also contributed to this growth. In contrast, heavy crude oil decreased 1.0% from November 2017. In a month when several Alberta producers implemented voluntary production cuts, in-situ production of crude bitumen (-9.7%) fell to its lowest level since June 2017. Over the same period, mined production of crude bitumen (+27.3%) reached a record high 8.6 million cubic metres. Crude oil production (excluding equivalent products) totalled 20.9 million cubic metres in November, up 6.2% from the same month a year earlier. Oil sands extraction (non-upgraded crude bitumen and synthetic crude oil) averaged a 9.6% year-over-year rise since January 2018, outpacing growth in oil extraction (heavy, light and medium crude oil), which averaged 5.2% over the same period. Alberta produced 18.9 million cubic metres of crude oil and equivalent products in November, up 8.8% from the same month in 2017. Alberta (83.1%), Saskatchewan (10.4%) and Newfoundland and Labrador (3.9%) accounted for the vast majority of Canadian production of crude oil and equivalent products. Exports of crude oil and equivalent products totalled 18.2 million cubic metres in November, up 21.1% from the same month a year earlier. November marked the second highest level of exports, after the 18.4 million cubic metres exported in May 2018. Exports via pipelines to the United States rose 15.5% to 15.4 million cubic metres, the 11th consecutive monthly year-over-year increase. Exports to the United States via pipelines has averaged 15.2 million cubic metres so far in 2018, compared with 14.4 million cubic metres in the first 11 months of 2017. Exports to the United States by other means (including rail, marine, and truck) were up 44.9% from the same month in 2017, to 2.3 million cubic metres. 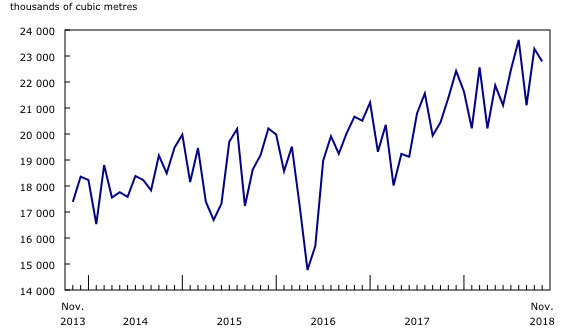 Exports to other countries continued on an upward trend, totalling 6.9 million cubic metres so far in 2018, compared with 1.8 million cubic metres in all of 2017. 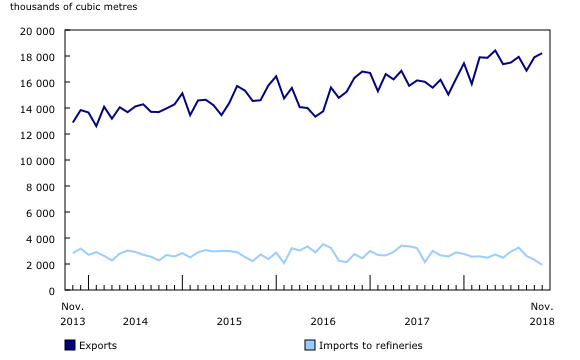 Meanwhile, imports of crude oil to Canadian refineries, which tend to be volatile, were down 25.1% to 1.9 million cubic metres. Closing inventories of crude oil and equivalent products totalled 18.9 million cubic metres in November, up 2.7% from the same month a year earlier, and consisted of inventories held by transporters (-2.9%), refineries (+14.5%) and fields and plants (+16.9%). Canadian marketable natural gas production decreased 3.3% from the same month a year earlier to 14.0 billion cubic metres in November. Production was concentrated in Alberta (70.0%) and British Columbia (27.8%). Additional information on natural gas is available in "Natural gas transmission, storage and distribution," published in The Daily on January 24, 2019. Data on crude oil and equivalent products, previously found in table 25-10-0014, are now published in table 25-10-0063. While table 25-10-0014 will remain available for reference, users should exercise caution when comparing these data with those in the new table. Information on the disposition of crude oil and equivalent products to refineries by province and on exports to the United States by district were discontinued. New data on imports, exports, input to Canadian refineries and inventories were added to table 25-10-0063. As of the January 2018 reference month, in accordance with the North American Industry Classification System 2017 update, conventional crude oil production will be referred to as crude oil extraction, while non-conventional crude oil production will be referred to as oil sands extraction. Data from April 2018 have been revised. Crude oil and equivalent products include heavy, light and medium crude oil, synthetic crude oil, crude bitumen, condensate, and pentanes plus. Export data are a combination of National Energy Board data and survey respondents' data. Import data include imports of crude oil by refineries and by others. Total marketable gas includes receipts from fields, gas gathering systems and/or gas plants. The crude oil and natural gas supply and disposition program uses respondent data as well as administrative data provided by federal, provincial and territorial authorities with regulatory responsibilities within their respective jurisdictions.